Allow user input, i.e. 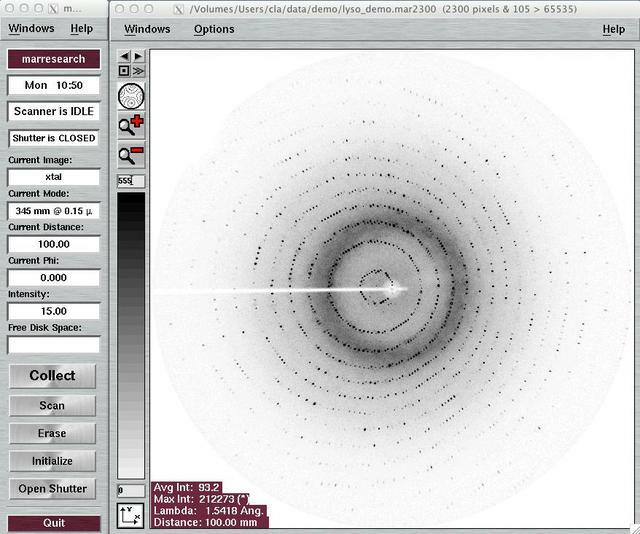 setup data collection parameters, analyze images, etc. User input is done via the user interface using text fields, option menues and arrow buttons. The mar345-detector is driven by an autonomous mini-computer which communicates with the host computer through an Ethernet interface. It features a real-time operating system which provides the well known IP services (ftp, telnet, ping, Unix sockets). It comes with a fixed IP-address of 192.0.2.1 for the mar345-detector and requires the network card of the host computer to be set to address 192.0.2.2. Program mar345 talks to the scanner using standard Unix sockets on ports 4441, 4442, 4443 and 4444. Please verify, that a computer can successfully "ping" to IP-address 192.0.2.1 (i.e. 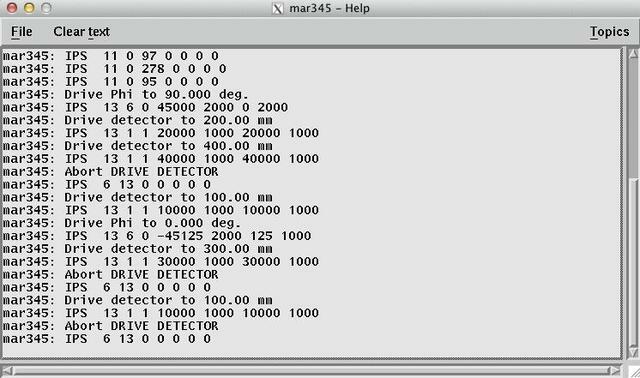 the mar345 detector), otherwise program mar345 cannot control the detector. When connecting the detector directly to the host computer, a "cross-over" network cable with RJ45-connectors is MANDATORY. When using standard network cables (i.e. with 1:1 wiring), a hub or network switch must be placed inbetween the computer and the detector. Transformation and data display requires memory as well as CPU-time. Typically, the program mar345 keeps the equivalent of 2.5 images in memory. When using images with 3450*3450 pixels, this corresponds to 75 MB. A minimum of 128 MB is therefore recommended for a host computer driving the detector, but 256 MB are actually more appropriate. Data collection should always have highest priority. However, there is little protection against abuse of the host computer's resources by other processes. In particular, memory consuming data processing jobs can cause drops in performance of the workstation to such a degree that nothing else will work. I/O-operations can be even more critical. This affects network I/O, in particular. Note: it is not advisable to write data out to an NFS-mounted disk since any problem on the network will affect data collection . MARLOGDIR $MARHOME/log Location of all log-output files and of data input files. The program mar345 expects to find subdirectories beam, log, lp, spy and sets. Very important: this directory must have write permission for the mar345 user! MARHELPDIR $MARHOME/man/ Location of this documentation files. This should be the parent tree with subdirectories 1, pdf, html, help and mar345. MARSTATUSFILE $MARHOME/log/mar345.status Periodically written output file containing hardware status bits. See section Output for further details. MARMESSAGEFILE $MARHOME/log/mar.message Periodically written output file containing software messages. See section Output for further details. mar345 can be invoked in a terminal window plainly by typing "mar345". The program however understands the command line options given in Table 2. Do not run the program in the background and do not use this terminal window for other purposes. The program will send important output to the standard output and you don't want to miss it, although almost all output can also be found in the log file. The program will also tell you if it is able to talk to the detector. If environment variables are not set you will be notified. At startup, the program writes information about connection success or failure into file $MARLOGDIR/mar.message. This message is read and displayed by program marstart which is called automatically by program mar345. If the program cannot connect to the detector, the program mar345 will be halted. Program marstart then offers a choice of either killing process mar345 or continuing with program mar345 without network connection. Note that it takes approx. 1 minute after turning on the mar345-detector before program mar345 can talk to them, even if the ping service is available within a couple of seconds time. After the initializations, the program presents essentially two windows: an image display area and the mar345 main window with status information and further input buttons. -host <string> -host 192.0.2.1 Host name to use for the mar345 detector. -colors <number> -c 32 No. of colors to use for image display. --default <number> --def 2300 Default scan mode to use (one of 3450,3000,2400,2300,2000,1800,1600 or 1200). -debug <number> -debug 16 Debugging flag (undocumented). --server <number> -s 8888 TCP/IP-server port to listen for commands to drive the program mar345. -verbose Increase printed output. No arguments. The menu bar allows for opening additional windows. Most of them can be opened either by selecting the corresponding choice with the mouse button or by pressing the corresponding short-cut key. Some of the windows can also be opened by pressing the status buttons or control buttons (see below). Reset Scanner Ctrl+r Sends a reboot instruction to the mar345 scanner. The Help menu pops up if the "Help" button in the menu bar is pressed or if "Alt+h" is pressed while the pointer is in the main window. Online help Pops up a window with the possibility to get some basic online as read from file $MARMANDIR/help/mar345.hlp. Shutter CLOSED none Shows current state of experimental beam shutter. 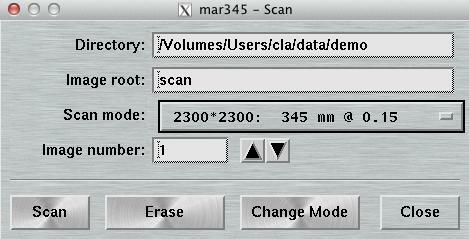 Erase Immediately starts to erase the imaging plate in the currently selected scanmode. The data collection menu and the way to set up different types of data collections is described in the separate chapter "Collect". The "Image"-window can be accessed by selecting the corresponding choice in the "Windows"-menu or by pressing the "F1"-key while the pointer is in the main window. This window is the area where to visually inspect images. The separate chapter "Image" describes the functionality of this window. The "Progress"-window can be accessed by selecting the corresponding choice in the "File"-menu or by pressing the "F2"-key while the pointer is in the main window. Here, you see the most important parameters of ongoing or programmed data collection runs. The data set that is currently active is marked in "mar" red and white fonts, the queued ones are shown with a lighter background. The ones that are already finished are drawn with a grey background. In this window you will also find the time the data collection needs to complete and the actual ending time. Set Data set as programmed in the "Change Parameters" window. Status Either "Active", "Queued" or "Done"
Time Exposure time in seconds. When working in DOSE mode, the time will be only approximated. Distance The distance detector-to-sample in mm. Phi The Phi at start of the current image in deg. Delta-Phi The no. of oscillations * Delta-Phi in deg. Format & Scanmode The shown string is the actual image name extension and corresponds to the choices for "Format" and "Scanmode" in the "Change Parameters"-window. To go Time in hrs to terminate this set. Ending at Time when this data set completes. Image Full path name of current image (or first image in set). The buttons in the lower part of the window are mostly self-explanatory. Some of the buttons will be made insensitive during certain operations. For instance, during a readout of the detector, the "Abort NOW"-button is disabled. Abort NOW Immediately abort the exposure or any motor movement. Stop after IMAGE Stop data collection of all data sets after finishing exposure and readout of current image. Stop after SET Stop data collection of all queued data sets after finishing the current set. Close Closes this window. Get this window back with the "F2"-key. 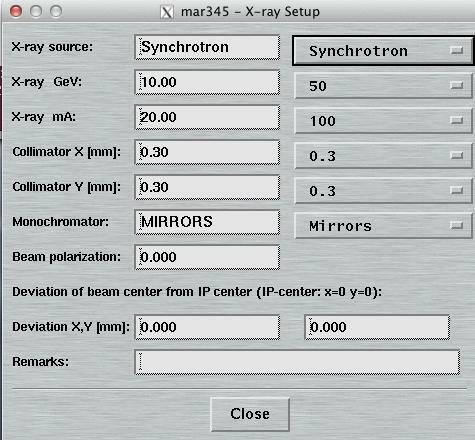 The "X-ray Setup"-window can be accessed by selecting the corresponding choice in the "Windows"-menu of the main window. Here, you can provide some information that is going to end up in the headers of images created by the mar345-detector. This information is strictly optional and there are no programs that are systematically making use of it. It would be good practice, though, to fill in the fields. A general experience is, that when working with images later you will have trouble to find notes written in a logbook, but it is straightforward to just look into the image header (e.g. with program catmar). 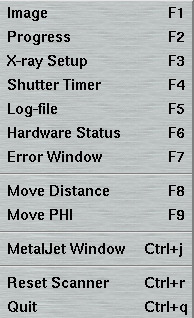 The "Shutter Timer"-window can be accessed by selecting the corresponding choice in the "Windows"-menu or by pressing the "F4"-key while the pointer is in the main window, or by selecting the corresponding tab in the main window. Here, you may manually open the experimental beam shutter of the dtb without having to setup an exposure. It should be noted that for normal users there is little need to do so. When opening the shutter, there will be a clock showing the time elapsed since opening the shutter. 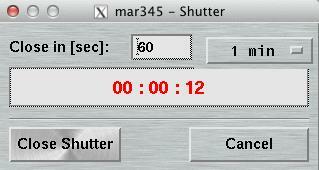 The shutter will automatically closed after the time given in the "Close in [sec]" text field has elapsed . The "Log"-window can be accessed by selecting the corresponding choice in the "Windows"-menu or by pressing the "F5"-key while the pointer is in the main window, or by selecting the corresponding tab in the main window. All hardware errors and warning as well as some additional information may be written inside the text area of this window. In case of hardware problems, first have a look inside this window to get some history of the problem. The "Hardware"-window can be accessed by selecting the corresponding choice in the "Windows"-menu or by pressing the "F6"-key while the pointer is in the main window. The "Error"-window can be accessed by selecting the corresponding choice in the "Windows"-menu or by pressing the "F7"-key while the pointer is in the main window. Here is where you will find important error messages and warnings. The "Move Distance"-window can be accessed by selecting the corresponding choice in the "Windows"-menu or by pressing the "F8"-key while the pointer is in the main window or by pressing any of the distance status button in the status area. Within this window, you can move the motor for the detector distance translation in the standard mar goniostat. You may also redefine the currently know position of the motor but only if the program "mar345" has been started with the command line argument "-setd". This is a protection for not accidentally overwrite an well determined parameter. 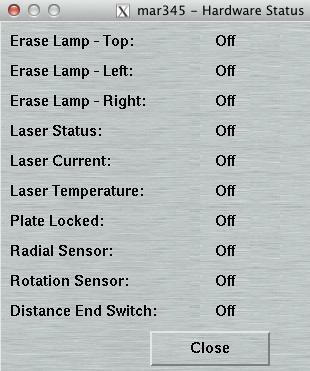 Please note, that the scanner controller always keeps the currently known values. Unless the detector is physically removed from the translation page, there should be no need to redefine this value. In case of doubt, it is suggested to "initialize" the distance translation stage with a premeasured value taken from the scanner configuration file. The "Move Phi"-window can be accessed by selecting the corresponding choice in the "Windows"-menu or by pressing the "F9"-key while the pointer is in the main window or by pressing any of the PHI status button in the status area. Within this window, you can move the motor for the PHI axis in the standard mar goniostat. You may also redefine the currently know position of the motor. The "Initialize"-window can be accessed by selecting the corresponding button in the main window. Here, you initialize the motor for the distance translation stage of the standard mar goniostat (see also chapter "Move Distance"). You may initialize the motor either at the far end (away from the sample) or at the near end (close to the sample). It should be noted that it is definitely safer to initialize the motor at the far end of the translation stage in order to avoid collisions with the goniometer head and/or or cryo-head. Also, when pushing the Initialize-button the program reloads the configuration file $MARTABLEDIR/config.$MAR_SCANNER_NO. If you want to do some changes to the configuration file and try the parameters on-the-fly, this is the way to do it. Please note, that parameters that affect the graphical layout of the program usually require a restart of the program. For details about the configuration file, see chapter Configuration File in section Input. Change mode, i.e. drive the scanning head inside the detector to the choosen scanmode and load the corresponding speed profiles. This feature is not used very often unless for very special experiments. This is why this window is accessible only via one button. For producing an output file, there is no choice of format. Images will always be produced in the mar345-format that is described elsewhere. The output file name follows the same rule as described in the chapter about data collection. With keyword "USE REFERENCE" in the configuration file, an additional field for "Reference image" is available starting with version 6.6 of the program. Here, you can enter the full name of a reference image. Please refer to the chapter 4.2.1 Directory, Image Root and Reference Image for further details.